How do you prepare yourself for success? Do you need to get motivated first? Or do you just take action? I recently was interviewed by Dr. Isaac Jones, founder of Designer Health Centers. We got into a great discussion on performance, mindset, and strategy for one of his upcoming podcasts. Stay tuned for the release of that. I recorded the video of our chat and there was some good stuff we talked about before we did the actual interview. In yesterday’s post I let you in on some vulnerability I had been feeling about losing motivation during my 90 day blogging plan. 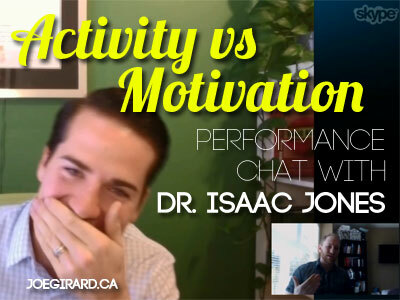 This 3 minute clip with Dr Jones goes through the plan and we talk about activity vs motivation. As I mentioned yesterday, it is tough to maintain motivation during your projects. It’s easy to get distracted and we are all guilty of it. The first step to overcoming the tendency to self-sabotage is to just totally be aware that you will do it. Awareness is always the first key to anything. Hey we’re all human, and let’s face it, we mess up. Accept it, and more importantly, plan for it. My biggest point is that to get motivated, you must TAKE ACTION. Not the other way around. Don’t wait to be excited. Get moving. Now, Dr Jones is a kickass guy. He has created a very clear vision for his Designer Health Centers in Georgia and works only with high-performing individuals, including some very high profile UFC fighters and executives. We had an awesome talk about how high performers can actually get more. Out of their health, their fitness, their time, and even their mind. Be warned, I do swear a few times in this clip. It was just a casual chat, but I wanted to share anyways! Now, the key take-away is that when you set your goals, it’s not about results. It is about action and activity. I have to constantly remind myself about this concept, especially when I am right in the middle of big projects. Get. things. done. Isaac has released the full podcast. Check it out here. Additionally, he will be launching the Higher Performance Summit that I will be a speaker on! This will be unreal! For another really high level look at this topic and ways to make lasting change, head on over to Marie Forleo’s site and watch Todd Herman’s interview that was just posted. He talks about 5 steps to change your life. Todd works with Olympic athletes and high level executives, and in this interview he dives really deep into some interesting reasons we do the things we do – on a cellular level. Check it out. So how do YOU create long-lasting change? Are you waiting to be motivated? or do you take action?